This is the season of high school graduations, and most of them are forgettable .... long lines of graduates crossing the stage and boring speeches by school administrators and class officers that will soon be forgotten. But two of those speeches are likely to have long-lasting ramifications. "I want to thank those that we look up to, they have helped carve and mold us into the young adults that we are today. I’m so glad that both of my parents led me to the Lord at a young age,” he said. “And I think most of you will understand when I say – Our Father, who art in Heaven, hallowed be Thy Name. Thy kingdom come ....." Well, I think you know how the speech continues. "We are all fortunate to live in a country where we can express our beliefs, where our mics won’t be turned off, as I have been threatened to be if I veer away from the school-censored speech I have just finished. Just as Jesus spoke out against the authority of the Pharisees and Sadducees, who tried to silence him, I will not have my freedom of speech taken away from me. And I urge you all to do the same. Do not let anyone take away your religious or Constitutional rights from you." Two very brave young men, who experienced very different results when they took a stand for their beliefs. In the case of Roy, he enjoyed thunderous applause as he began the Lord's Prayer, and if you watch the video of his speech, you can even see smiles and consenting nods from the school officials sitting behind him. 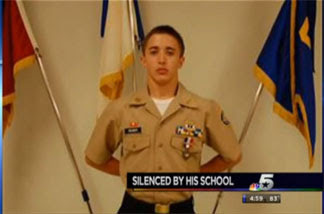 In fact, the school has no plans to punish the former student for his actions. That won't stop atheist action groups from filing suit, of course, but Mr. Costner wasn't afraid to challenge them. Neither was Remington, but, alas, he didn't receive such a positive response. 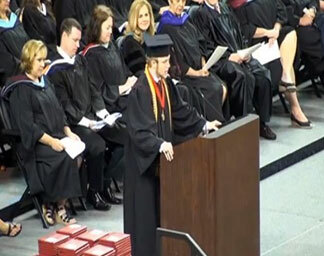 As soon as he uttered the above words, his microphone was cut off and his speech ended. In this instance, it wasn't the invocation of his faith that was objected to; in fact, that part of his speech had been pre-approved. It was when he veered from his prepared remarks and cited the Constitution and his right to free speech. While you may think cutting off his mic was over the top, there is more to this story. His father, Todd, is a doctorate-level physics and math teacher at the same high school his son attends. And Remington will be a freshman at the Naval Academy come fall. Apparently, the principal of the high school, the day after the silenced speech, allegedly threatened to write a personal letter to the Naval Academy and strip Remington of all honors related to character. Of course, the principal denies the charge, and the Reimer family is not happy that the situation has escalated to this level. They feel that if a disclaimer that was left out of the graduation program had been included, it might have alleviated the discord: “the content of each student speaker’s message is the private expression of the individual student and does not reflect the endorsement, sponsorship, position or expression of the District.” But would it have? Both of these incidents are a reflection of the rigid policies and regulations that threaten our society. While Americans are becoming more aware of the threat against our faith and are willing to stand up against authoritarian policies, it is also becoming quite apparent that our Constitutional rights are being dismissed and reduced. By refusing to remain silent, we invite both censorship and suppression. 1 Peter 3:15-16 "But in your hearts revere Christ as Lord. Always be prepared to give an answer to everyone who asks you to give the reason for the hope that you have. But do this with gentleness and respect, keeping a clear conscience, so that those who speak maliciously against your good behavior in Christ may be ashamed of their slander." Labels: Big Brother, Constitution, Liberty and Freedom, Our Culture. I'd be very proud if either one of these young men were friends or sons of mine. I'm grateful that they have the insight and bravery to stand up for what they believe and know their God given rights, unlike so many adults who do, but are COWARDLY to say so. I hope those people who DON'T STAND UP for what they see on a daily basis in our country and letting it just fly, who just can't bring themselves to stand up for their rights and let others take the blame, well, it will be at their front door and in full force soon for what these so called "leaders" have planned for this country. As I've said many many times, I really question people and their motives. I wonder if anyone out there, other than a few, know that their tax money is being spent on seducing them, making them dependent on the system and to top it off, to take our liberties and rights away and we continue to PAY these people that they elect to make us miserable and to be dishonorable to those who fought for these freedoms and this country! Honestly, I really question where the intelligence of this country has gone! I'll say thank you to these young men again and others like them who can make a stand for "the people" who do give a care about themselves and others and see the future for what we're leaving for our children and grandchildren. As far as I can see so far, I doubt seriously this country will be anything like it is even now in five years. All I can say anymore is..... good luck to everyone. We're being put and led in position to have the mentality of "every man for himself". We can talk all we want, but all the talking isn't helping, is it? All I do anymore is pray because it's only Jesus who will make this right in the end. Lisa, I, too, am feeling the despair of knowing the path we are on. Just read the daily headlines ... it gets worse each day, with no sign of turning back. Praying is the most important thing we can do, and hope that God will show us where to stand. It makes me sad for all the children being born that will never know the greatness of what America used to be!